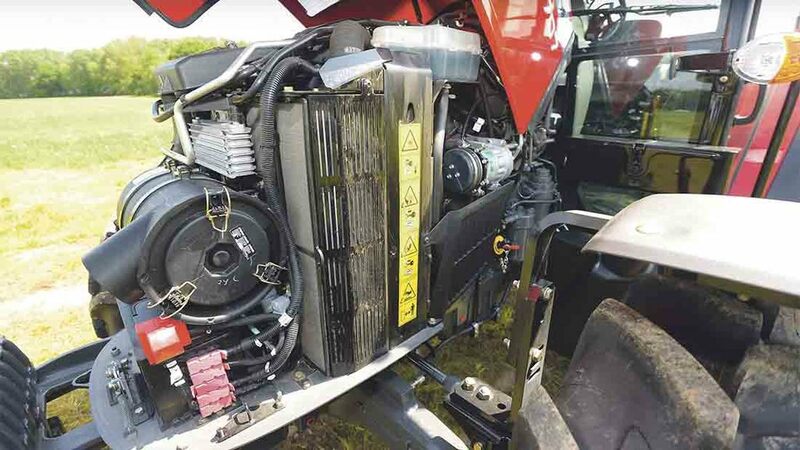 Following an eight year development project, a $350m investment and more than 65,000 hours of testing, Massey Ferguson’s 4700 Global Series is finally available in the UK. James Rickard gets behind the wheel for a test drive. The Massey Ferguson Global Series represents a major investment for Agco, but one which could prove very lucrative. This year’s Czech TechAgro machinery show in April heralded the completion of Massey Ferguson’s Global Series tractor project. Now spanning three ranges; the 4700, 5700 and 6700, seven models range from 75 to 130hp. The 4700s are available now in the UK, with the 57 set for availability in November and the 67 in Q1 of next year. To recap, the Global Series is MF’s answer to a modern take on a basic tractor, designed to meet the needs of multiple markets around the world which do not require high specification machines. That includes Europe too, with cabbed versions of the series targeted at livestock and mixed farming enterprises, for example. The Series does not replace any models in MF’s range, but is there to offer a lower-spec alternative to its more sophisticated machines. 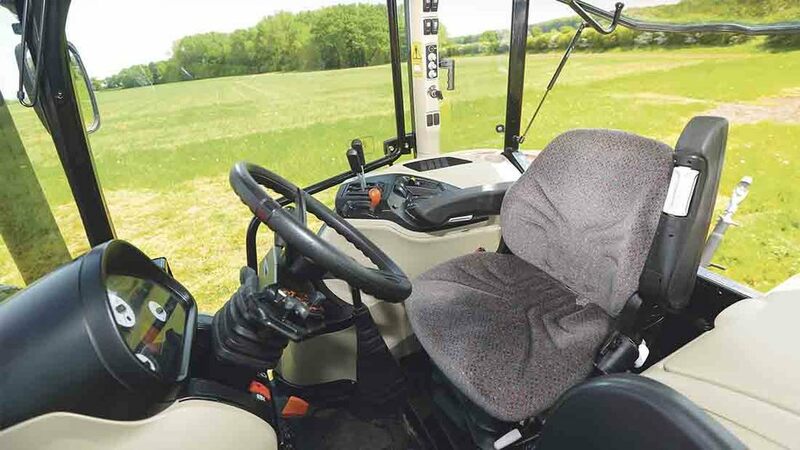 Global Series' cab is spacious for a small tractor. To find out what is in store for potential customers, we try out the entry level 75hp 4707 model. Brand new from the ground up, the 4700s get 3.3-litre, three-cylinder engines, a 12 by 12 transmission and a 3,000kg rear linkage lift capacity. First impressions are good. Proportions seem right and its aggressive family styling makes it look fit for purpose. Wide opening doors offer unhindered access to the cab, which greets you with plenty of space to stretch out. Layout is well thought out with most controls falling to hand. Often ergonomics in this power class can be an afterthought, but not on the 4700. Simple controls make the tractor very jump on and drive. 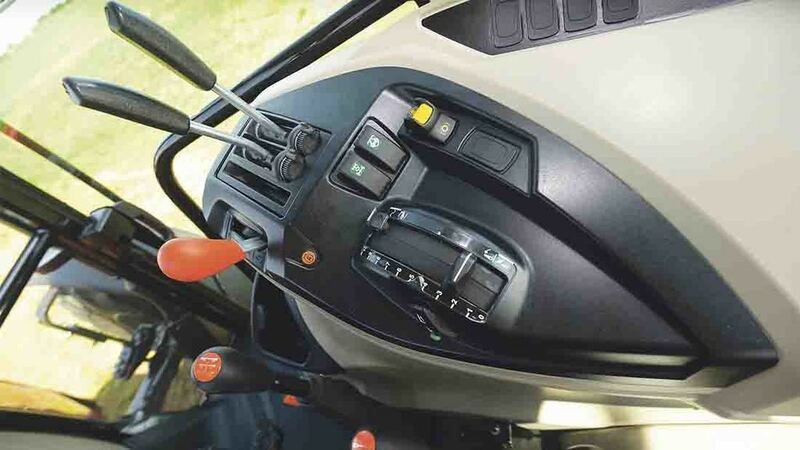 Controls are simple to understand, making the tractor very jump on and drive. Ideal then for casual staff or anyone who thinks things like headland management is the work of the devil. The tractor’s pint-sized proportions make all-round visibility good, however, it is currently missing a roof window option, which we are told is on its way, and will be a useful addition for those who wish to fit a loader, which will be a high percentage suggests MF. 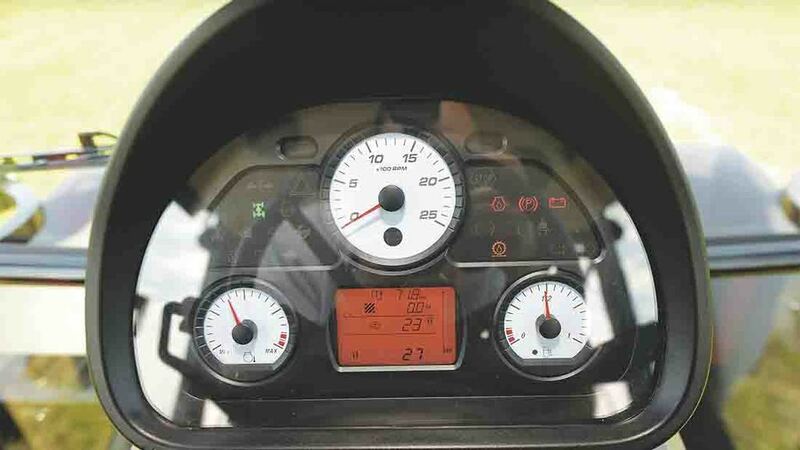 Dash information is easy to garner, with a mixture of clear analogue dials and digital readouts used. On top of basic info – fuel level, temperature and revs – service intervals, fuel consumption, distance travelled and worked area can be viewed. An electro/hydraulic shuttle option makes light work of direction changes. Despite its basic credentials, the 4700 is not completely devoid of electronics. Differential lock, four wheel drive, pto engagement and rear linkage are all electrically controlled, offering up a modicum of creature comforts we have all come accustom to in this part of the world. Ours also came fitted with the firm’s optional Power Control Lever, offering clutch-less shuttling – a mechanical shuttle lever is available. 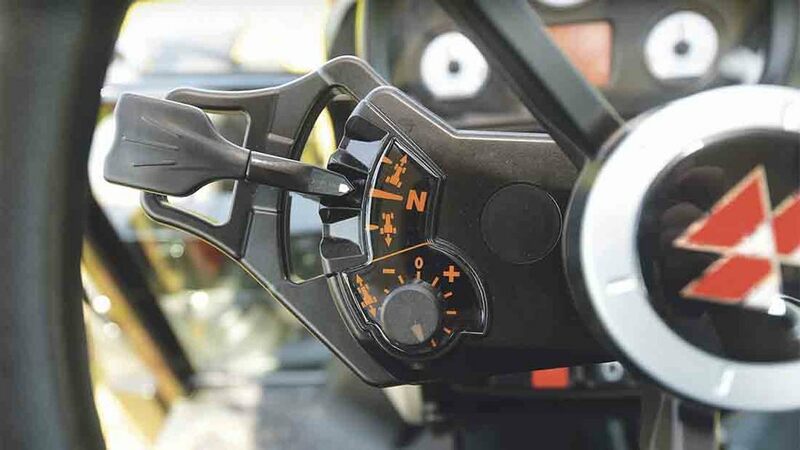 With the Power Control Lever option, shuttle aggression can be altered via a knob and a de-clutch button is incorporated into the rear of the main gearstick allowing clutch-less gear changes. Information from the dash is easy to garner at a glance. An engine rev memory function is also a feature. To use, simply get up to the revs you want then press and hold a button to save. To turn on or off, just press the button again. Gear selection comes from one main gearstick, allowing six gears to be shifted through. Thanks to car-inspired design, gear selection is pretty slick, and fairly easy to find considering there are six of them in there. You don’t have to reach into the next county either to find the fifth and furthest gear away from you. High and low ranges are selected via another lever, down near the driver’s right hand side. Clutch pedal is light with a good amount of predictable feel. With electric linkage control comes fender buttons. 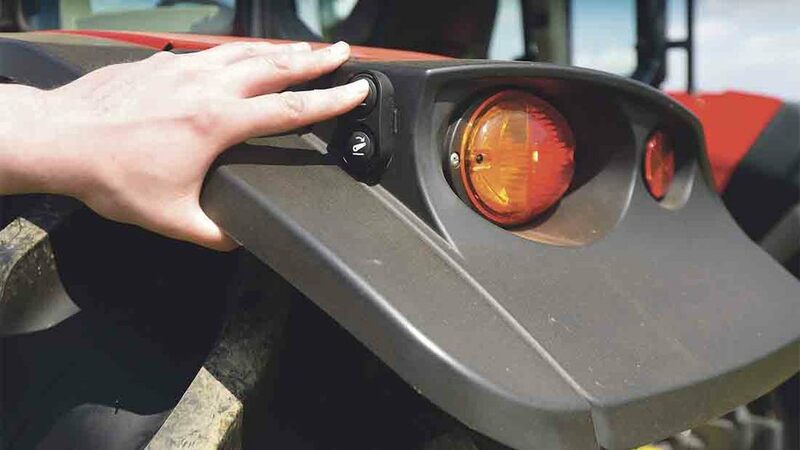 Linkage control is very similar to that used on the rest of the manufacturer’s tractor ranges, which uses a slider to alter position and a three-way rocker switch to raise and lower. Incorporated into the rocker switch is a ‘dump’ button; useful for dropping a plough into the ground. With electric linkage control, also comes fender controls. As an option, extra linkage controls can be specified which allow draft, top limit and rate of drop to be adjusted. Practicalities are not lost on the 4700 too, including the left-hand biased positioning of the rear spools, making them easier to get at. Engine bay access is good thanks to a one-piece bonnet. A reassuringly sturdy-looking toolbox lives near the left hand cab door, providing a convenient home for linkage balls, pins and the like. And a one piece bonnet provides easy access to the engine bay, from where daily checks can be easily made. Inside the cab, storage is ok for this size of tractor, providing a lidded cubby hole big enough to fit a lunch box and a pocket which can accommodate two, two-litre bottles. Plenty of vents around the cab help keep you cool or the windows de-misted. It is fair to say we like the Global Series a lot. 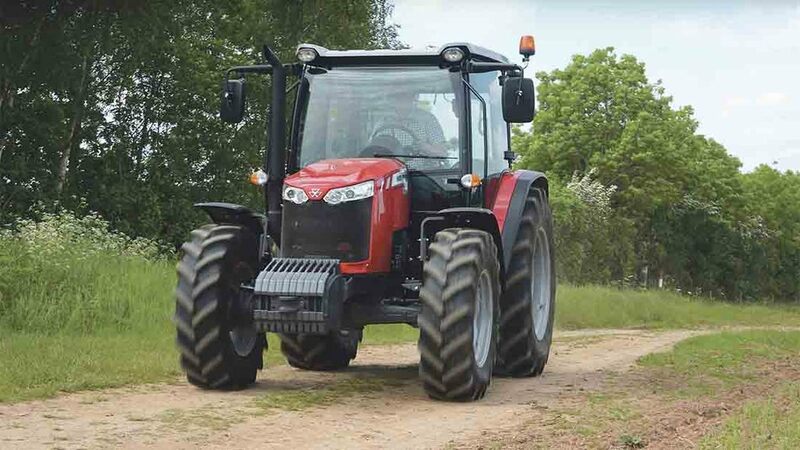 Straightforward, practical design, with a level of refinement you would expect from a modern day machine, we would quite happily spend all day on this tractor. The Global Series is something MF’s line-up has been missing for a while, particularly as its bread and butter 5400s, 5600s and 5700SLs have progressively got more complicated with each generation. 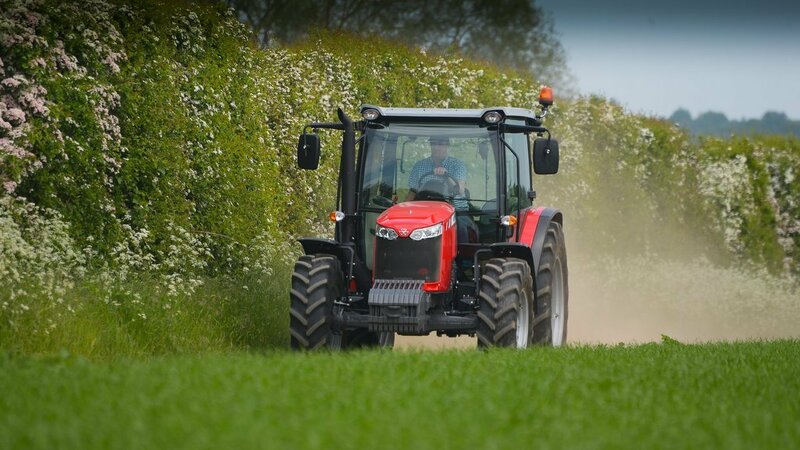 We can see exactly where this tractor will fit into UK farms, particularly in the livestock and mixed farming sectors, but also on vegetable farms. However, price is key with this tractor. With almost every manufacturer offering something in this class, it has a phenomenal amount of competition, not just from the big makes but from all those alternative challengers such as Branson, Kioti, ArmaTrac, etc.